Tender smoked beef brisket, mixed with some savory vegetables, herbs, and just a hint of spice, sandwiched in the city’s best puff pastry, and baked into deliciousness. 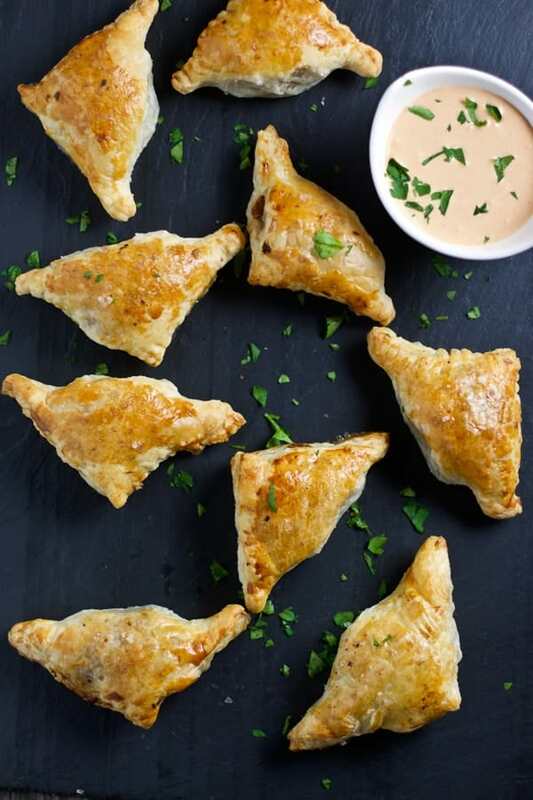 Just when we thought leftover brisket ideas didn’t get any better, we give you Smoked Beef Brisket Empanadas! Right around the time we first started coming up with recipes for leftover smoked brisket I joked that I wanted to start a series called 101 uses for leftover smoked brisket. But when we actually sat down with a pen and paper (and a bottle of wine) to brainstorm all of the possibilities (yes, we totally do that kind of thing), we realized that there really are 101 (and more) uses for the tender smoky leftover meat. But even back then, the one Sean always wanted to try was brisket empanadas. We started working on them last summer. I know now what held Sean back was feeling like we needed to come up with our own original dough recipe. So we tried. The dough always came out fine, but there was nothing unique about it (why recreate the wheel?). Plus, after all the work we went through to cook up the brisket we really didn’t want to spend any extra time on a dough. We’re not bakers, we’re barbecuers. What made things even easier was that the kids did all the cooking! Boom. My job as a parent = complete! Just kidding. Though they help. 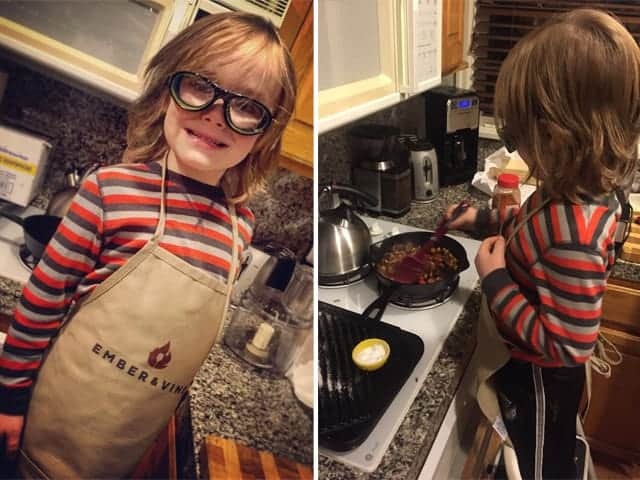 This little guy also realized how painful the job of chief onion chopper can be on the eyes. Thank god for onion goggles! We’ve tried variations on this recipe with homemade pizza dough, our neighbor’s pastry dough (it was amazing Becky! ), store-bought frozen puff pastry, and Grand Central Bakery’s puff pastry. The later is our current favorite. Their dough rocks. It’s about twice the price of the generic grocery store frozen dough, but if you’re going to be rocking out a delicious appetizer like this for your friends, then you want the best you can find (or make yourself). The Grand Central Bakery pastry dough is a great option if you don’t want to make your own. And it’s Portland local (woot woot)! As caterers they have become our go-to bakery for rolls and breads. Their products are high quality. 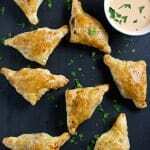 And we really like the flaky and flavorful buttery pastry dough to balance with the savory and smoky flavors of the filling. But feel free to use whatever dough you wish for this. Like I said we spent the time coming up with this awesome filling, and left the dough up to the baking pros. First and foremost start with your leftover smoked brisket. 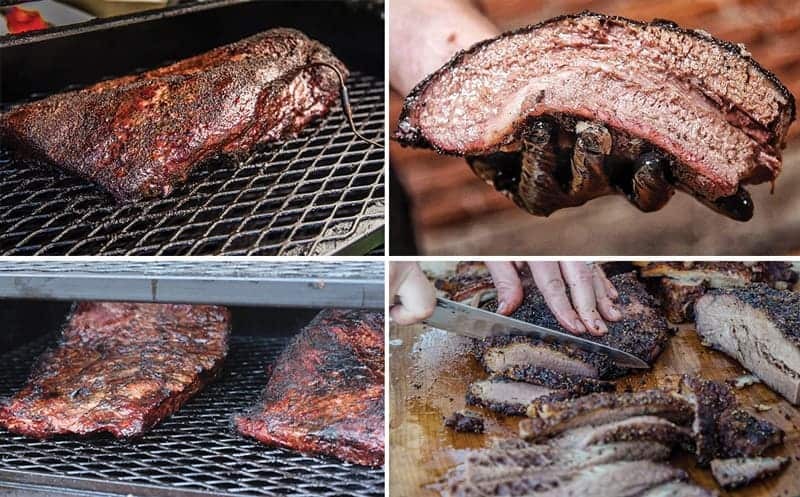 Need a good brisket recipe? 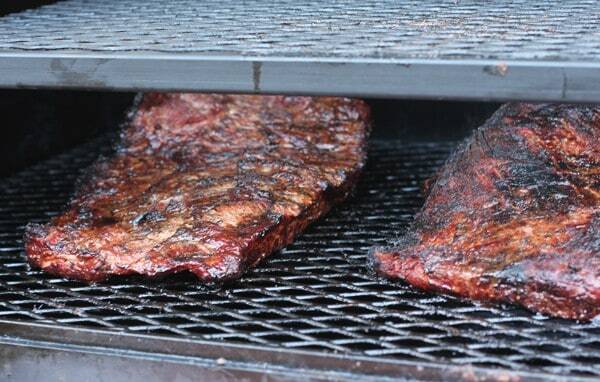 Use this complete how-to guide for Smoked Beef Brisket . 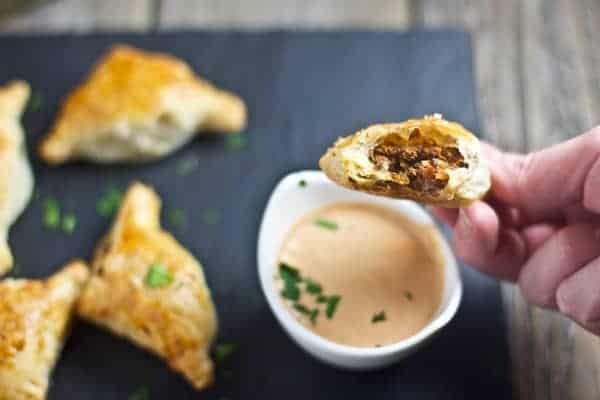 In a large skillet, add your empanada filling ingredients and cook until soft. Then place in the food processor and pulse just a few times. You still want to see chunks of the meat and vegetables, not a paste. Then work with your dough. We cut it into 3” long pieces, and then divide into 3” x 3” squares. I see a lot of recipes that call for circles, but circles will create extra dough that you will have to either re-roll out or discard. With squares you get perfect portions, none leftover to have to re-roll. I roll the dough a little bit thinner than the way the way it comes in the package. I find that it’s just a little too thick direct from the package, making the final empanada more dough than filling. I want to taste that delicious filling, so I roll the dough just a little thinner to balance out the flavors. After rolling out your dough, brush the sides with a little egg wash (you can use your finger for this), and then place a heaping tablespoon of the filling in the center. Take one corner to the opposite corner and seal the edges together using the tines of a fork. Place on a baking sheet lined with parchment paper. Optional, you can brush the tops with more egg wash. We’ve done it with the wash and without and find that the wash just gives it a nice sheen when it comes out of the oven. Bake for around 20 minutes, or the dough is golden in color. Serve with your favorite dipping sauce. We like this creamy crème fraîche BBQ dip below (recipe provided). It provides just enough flavor without taking away from the meaty filling. An incredible use for leftover smoked brisket and great appetizer idea for the holidays. 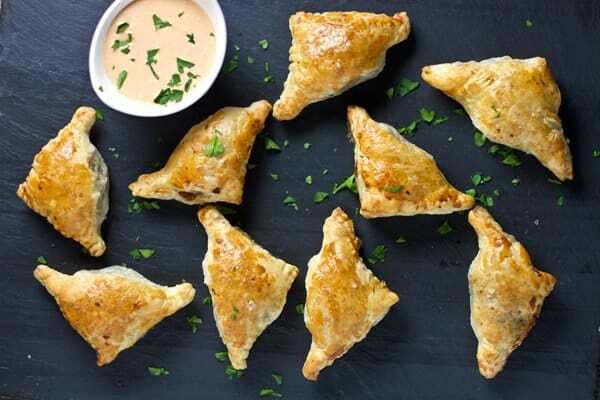 Smoked brisket, sautéed vegetables, herbs and spices rolled in puffed pastry dough and served with a creamy crème fraîche BBQ dip. In a medium sized skillet add 1 tablespoon extra virgin olive oil, and add onions and peppers and cook about 5 minutes, until starting to soften. Add the brisket, garlic, and jalapeño, and 1 tablespoon BBQ sauce, and cook an additional 5 minutes. Place the mixture in the food processor, add the cayenne powder and parsley, and pulse a few times (just enough to mix everything together, but not so much that your filling looks like a paste). Taste and adjust seasonings. If it’s too dry, add an additional tablespoon of BBQ sauce and pulse again. Roll out dough into 12 squares approximately 3” by 3”. If you are using store bought puff pastry I like to roll it out a little thinner than the way it comes from the box. Brush the edges of small squares with egg wash, and place 1-1 ½ tablespoons of the filling in the center. Fold one edge to meet the opposite edge and seal edges together using the tines of a fork. Place in oven and bake for 20 minutes, or until the dough is golden. Mix everything together in a small bowl. Transfer to serving bowl for dipping. Want more leftover brisket recipes? I could eat 1,000 of these. ooh I love me a good empanada. Never thought of using brisket before though! 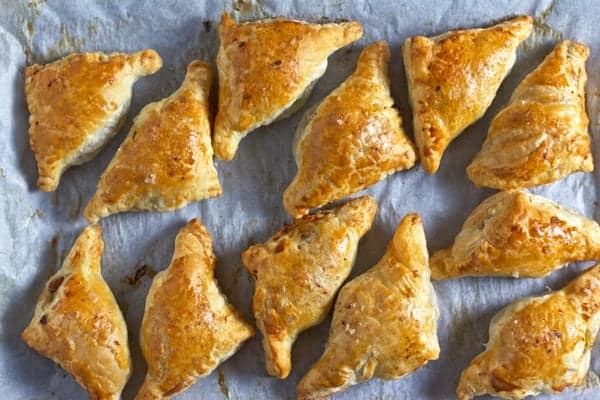 The great thing about empanadas is that you can use whatever the heck you want as a filling. Brisket just rules!!! These look so tasty! I love how flaky the crust is! Yes! The flaky crust is definitely one of the many great things about this dish! I don’t make empanadas often but they are one of my favorites! We love to grill out all year long so I definitely know we are going to try your BBQ Brisket recipe. Yum! Thanks 🙂 And yes, we also use a lot of store bought puff pastry. Their bakery version is far superior! So good! OMG these look absolutely amazing! I love the idea of using leftover brisket for this– thanks for sharing! OMGOSH! These look SO fantastic. I can’t believe how tasty they look. So excited to attempt to make these. 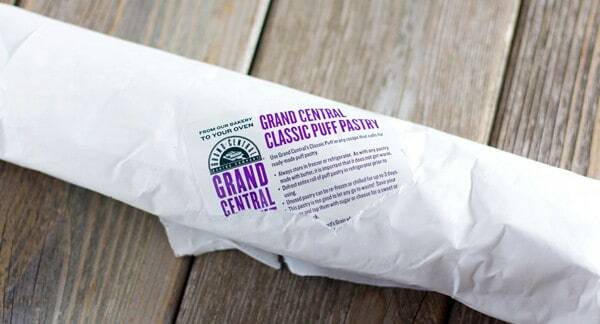 First, I absolutely adore Grand Central Bakery’s puff pastry!! It makes SUCH a difference which puff pastry is used! Second, I’m in love with everything about this recipe, Mary. Everything. I might need to make extra brisket over the holidays to ensure we have leftovers so I can make these! Do y’all think these can be frozen after cooking and reheated? If you plan to freeze any of them then I would freeze them before baking them. If you bake them first, then freeze them, then thaw thaw and reheat them the pastry dough will likely be soggy and soft, instead of crispy.